Some people swear by garlic tablets for keeping away colds. Why not just eat some actual garlic instead? Or some garlic bread. I’m sure it’s just as good. Anyone reading this who’s got a cold right now, I hope you feel better soon! Oh and by the way… There’s a special treat for you in the blog section. I’d much rather eat some nice garlic bread than take supplements. Also, I love that Colin takes WellWoman.. is Countdown’s influence perhaps seeping into this comic?! 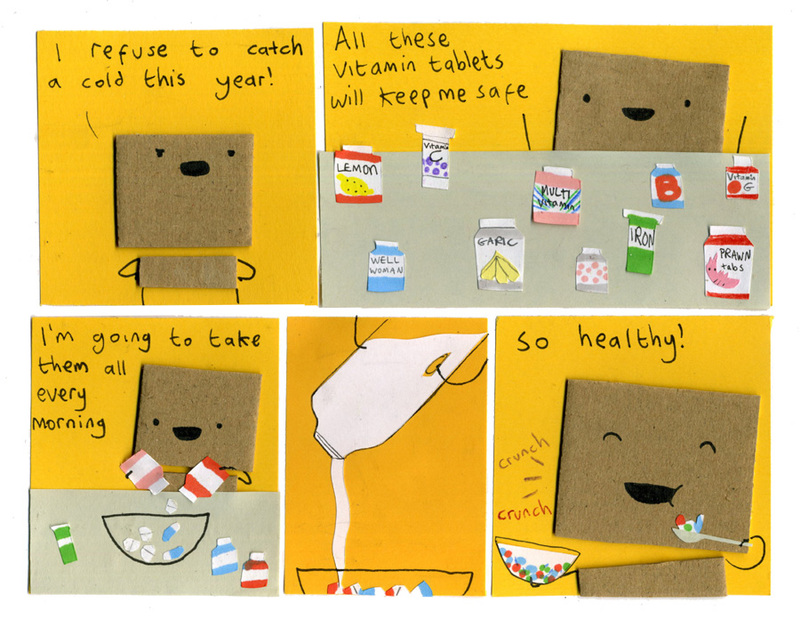 I don’t think you get a crunching sound when you eat vitamins, you swallow them! He looks like hes really enjoying them like cereal! I want cereal…. tablets with milk? I’ve yet to try that..
i prefer vitamins as a topping on my cereal. or on ice cream! Does “garic” make you overly and inappropriately bright, with a hint of garlic? Heeeeee’s gonna trip, isn’t he? BTW, I know you can’t get high off eating too many vitamins. Is strikes me that, as an implied criticism of marketing and consumerism, this might be the closest My Cardboard Life has come to cynicism. Funny, I’m recovering from a cold now. Hope he doesn’t suffer from overdose. Wow, the things Colin does not to catch a cold… he must get pretty bad ones! Prawn tablets? O.o Maybe I should’ve had those, I’ve been sick for a week now. Thanks for the well wishes, Philippa! Someone tell Colin that vitamins only restore any vitamins you may be missing, and most of it just goes out in your excrement. Expensive urine, Colin.